Claudio (born 19 February 1952, São Paulo) is a Brazilian-born Italian musician and film composer. 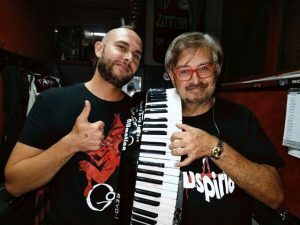 The keyboardist of the progressive rock band Goblin, Simonetti has specialized in the scores for Italian and American horror films since the 1970s. A long-time collaborator of director Dario Argento, Claudio has worked on several of the director/producer's films including Deep Red, Suspiria, Dawn of the Dead, Tenebrae, Phenomena, Demoni, and Opera. His work has long been an iconic staple of Italian genre cinema, collaborating with directors like Ruggero Deodato, Umberto Lenzi, Lucio Fulci, Enzo G. Castellari, Lamberto Bava, and Sergio Martino. 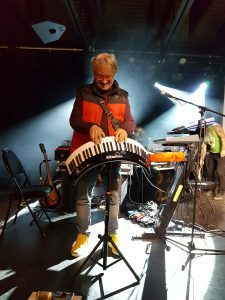 His highly experimental scores are known for their signature, electronic and progressive rock-influenced sound, and have been imitated numerous times. He studied at the Conservatorio di Santa Cecilia in Rome. In 2010, Claudio reunited with his former Goblin bandmates Massimo Moranti and Maurizio Guarani along with his group Daemonia's rhythm section to form New Goblin. They played several concerts around the world. This lasted until the fall of 2013 when he left New Goblin along with Daemonia's rhythm section to reform Daemonia under the new banner Simonetti's Goblin.